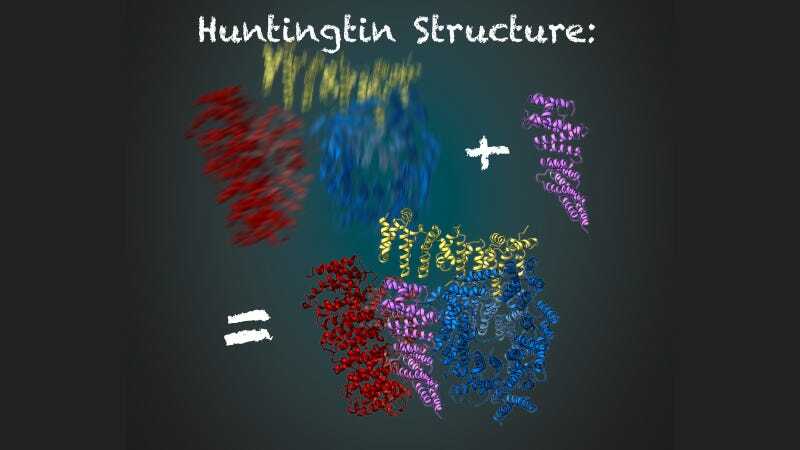 Scientists announced that they have observed the structure of huntingtin, a large and essential protein in many animals’ bodies which, when produced by a mutated gene, causes Huntington’s disease in humans. Huntington’s disease is a heartbreaking disorder that causes degrading brain cells, leading to difficulties controlling movement and behavior, and eventually death. There’s no known cure or effective treatment to slow or stop its progression. The average age of onset is 40 years. It’s inherited genetically, and about 30,000 Americans have it, according to the NIH. The associated huntingtin (aka HTT) protein has previously proven difficult to image due to its flexibility; it was literally too floppy to get a clear look at. German scientists have now used a Nobel Prize-winning method to create an image of the protein. “To better understand what such a very big protein does, it helps if you know how it looks,” study author Stefan Kochanek from Ulm University in Germany told Gizmodo. The protein is perhaps 10 times larger than average proteins. In turn, understanding the structure of the protein and how the mutation changes it may explain the effects of Huntington’s disease, as well as help researchers one day develop a cure. Rather than image the molecule alone, the researchers imaged it in a complex with another protein, HTT-associated-protein 40 (HAP40), which stabilized the huntingtin. The researchers gathered both proteins from healthy human cells, combined them, froze them, and imaged them with electrons. The imaging revealed that the huntingtin protein consists of two regions of molecules connected by a thin bridge—it sort of looks like a pair of headphones. HAP40 sticks right in the middle, like a head wearing the headphones, thus stabilizing the huntingtin molecule, according to the paper published this week in Nature. The research also supports the idea that the huntingtin protein is a hub where several other proteins interact. There’s more science left to be done. Harding points out that the region that’s altered in Huntington’s patients is missing from the analysis—so there’s a lot of work to do in order to understand how the mutation leads to symptoms in patients. Kochanek’s team will, in the meantime, look at what function the HAP40-HTT complex has, and whether HAP40 has functions beyond structural stabilization. “Maybe it could connect huntingtin to some other proteins,” he said. In the meantime, scientists are looking for a cure for the disease. Since mutated genes lead to misshapen proteins, some have thought of using CRISPR, the gene editing technology, to reverse the mutation. This seems to have worked in mouse studies, for example. Will Healthcare Inequality Cause Genetic Diseases to Disproportionately Impact the Poor?